Developing and deploying a scalable, globally-available web application on conventional data centers involves a lot of manual effort which results in lower efficiency and return on investment (ROI). High peaks and oscillating traffic lead to either under-provisioning or overprovisioning of resources. When a user request is received on your website, it is served by the nearest Alibaba Cloud DNS server which resolves the domain name and automatically routes it to the infrastructure running on Alibaba Cloud services. The user request is then handled by a web traffic distribution service, Server Load Balancer, which automatically distributes incoming application traffic among multiple ECS instances in a round robin manner. 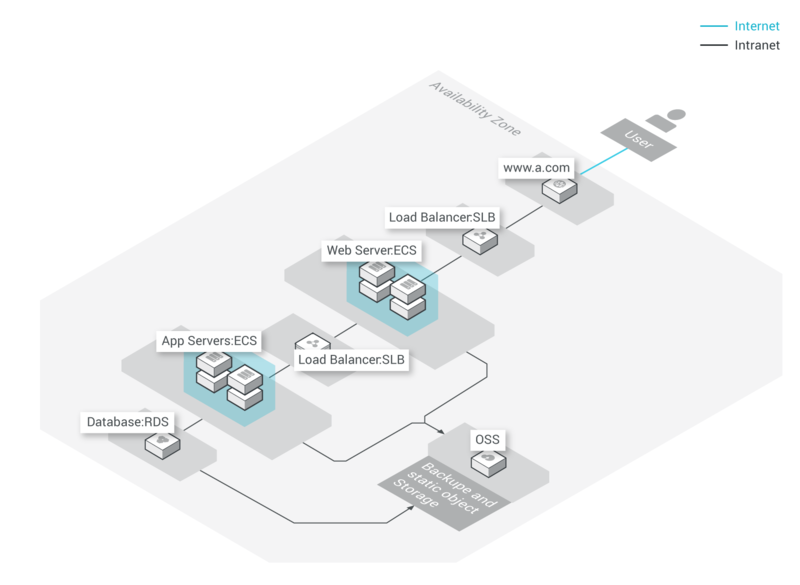 Both application and web servers are hosted on scalable ECS instances provisioned in multiple availability zones. To store and manage relational data, application servers are connected to ApsaraDB for RDS databases. First class VPN solution which supports IPSec tunnel VPN, GRE tunnel VPN, Dialing VPN based on open VPN software, SNAT, DNAT. The latest CentOS (7.2), integrated with one of the world's most popular website/blog building and publishing platforms. CentOS 7.2 integrated with Nginx web server. Includes a list of images, pre-integrated with popular software for web solutions. A Universal JAVA environment which supports Tomcat, HTML5 Web Socket. Provides rich user experience for websites and provides support for Android mobile developers. Easy to use cloud storage that allows you to process and handle millions of requests per second. The product also supports media applications, as well as big data, scientific and financial analysis. An on-demand cloud database service which increases your efficiency with automated monitoring, backup and disaster recovery capabilities. Download the Alibaba Cloud Web Application Hosting Solution architecture. Learn more on how to get started with Alibaba Cloud Object Storage Service (OSS). Learn how to seamlessly distribute incoming traffic using Alibaba Cloud Server Load Balancer.